Have your quilt top quilted on a Gammill Optimum longarm sewing machine along with the Statler Stitcher. Choice from hundreds of clean precise patterns from simple edge to edge to more complex custom quilting. There are many colors of thread, one tone or veriegated colors. The color of thread will compliment your quilt top and not overpower it. Provide your own batting or purchase batting from us. We carry Hobbs black 80% cotton 20% poly 108 inches wide, Warm and Natural and Warm and White 100% cotton 90 inches wide and Warm and Natural 120 inches wide. If you provide your own batting please send it with packaging. Know that your tops will be quilted with care and returned to you in a timely manner. Pattern design-Do you want a special pattern, name or picture quilted on you quilt? Have it digitally created by Caren. Binding-Standard, I will sew the binding on the front by sewing machine and Claudette will hand sew the binding to the back of the quilt. Quilt Repair-Has your favorite quilt been loved too much? Are some fabrics holding up better than others? We can repair your quilt with a fabric you provide so that it can be cheerished for many years to come. Memory Sports Quilt-Has your son or daughter been playing sports for years and you have a pile of jersey that you can't seem to part with? Let us turn them into a memory quilt for your family. 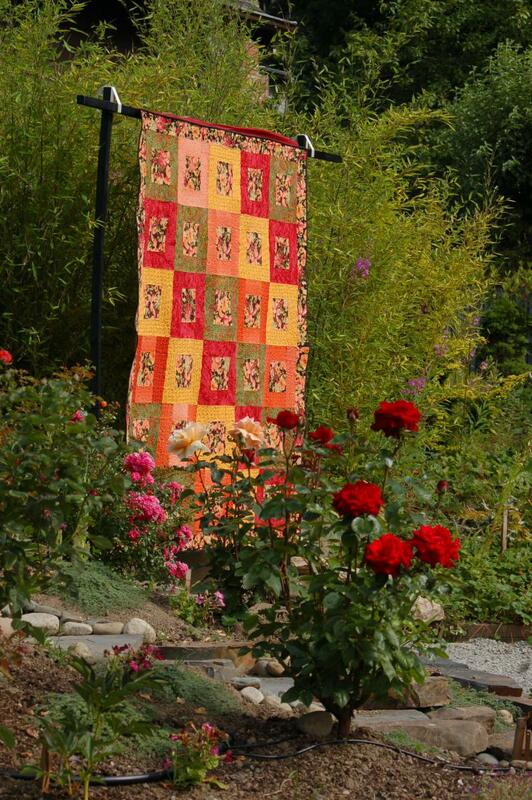 Flower Bed Quilts-After the garden and quilt show was over and we started taking down our quilts, the gardeners all had the same comment, "Now that place in my garden looks bare"...and Garden Quilts were born. We couldn't leave fabric quilts up in the garden. The sun and other elements would destroy them very quickly. Caren and I have painting ceramic tiles to look like quilts. We have come up with a way to mount them in the garden. To give even the darkest part of your garden some color. Stay tuned for pictures. Meanwhile enjoy one of my other quilts displayed at the show.